MitoXcell, a raw cacao company, is partnering with fitness expert Natalie Jill in Washington D.C. this weekend in support of her new book: Natalie Jill’s 7 Day Jump Start: Unprocess Your Diet. MitoXcell will be featured as one of the components in a healthy diet. Courtney Engelman, Natalie Jill and Aaron Susi pose for a photo at the premier of her book in Los Angeles. Top 100 fitness expert Natalie Jill is holding an event in Washington D.C. this weekend in support of her upcoming book: Natalie Jill’s 7 Day Jump Start following a wildly successful premier event in Los Angeles this week. The 7 Day Jump Start plan is a nutritional guide designed to help people begin a new healthy lifestyle featuring simple recipes using MitoXcell’s raw cacao formula. 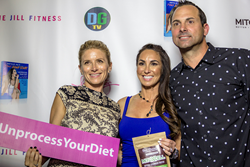 The local raw cacao company, MitoXcell, partnered with Jill in Los Angeles this week bringing together 60 of the top industry leaders for health products and healthy living. The event was a massive success, kicking off the series of three events across the country for the book. MitoXcell is a unique five ingredient raw cacao combination containing raw cacao, echinacea, l-carnitine, alpha lipoic acid and trans resveratrol that is proven to reduce recovery time, increase endurance, strength and natural energy production in your body. MitoXcell is an all natural, vegan, organic and raw product. Natalie Jill's book will contain many recipes and body weight exercises that will help with weight loss, exercise and maintaining a healthy diet for proven weight loss just in time for the summer. With the help of MitoXcell in many of these recipes, these effects are more noticeable. Following the event in Washington D.C. this weekend, Natalie will continue gaining support for her book and hold another event in two weeks in San Diego with support from MitoXcell along with support from other local companies.